These two little cuties are such posers! If you missed last year's free St. Patrick's Day t-shirt download, here's another one for you to enjoy. 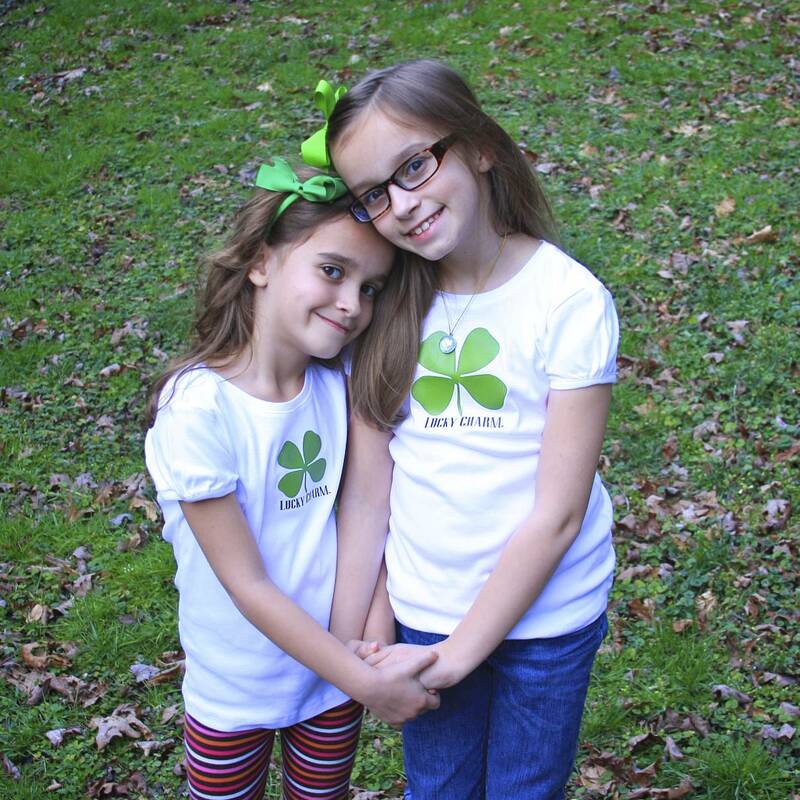 There are three different sizes of four-leaf clovers...one of them is sure to be the perfect size for your lucky charm! Victoria is sporting the smallest Lucky Charm, Isabella has the mid-size Lucky Charm and Big Mama here will be donning the largest Lucky Charm. I'll share when I have my t-shirt made, but only if you promise not to laugh. 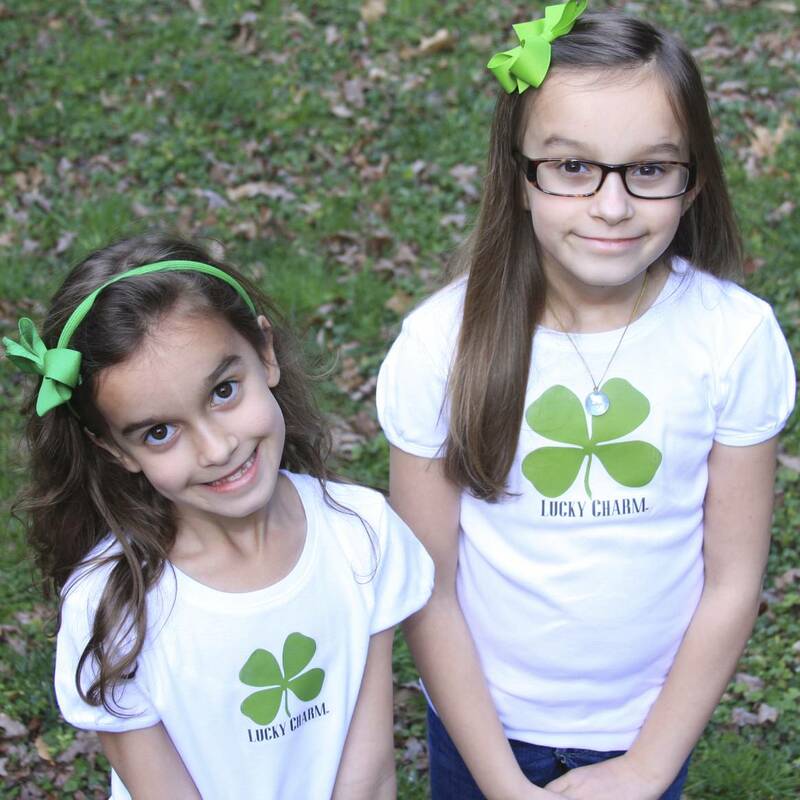 When you download your Lucky Charm St. Patrick's Day t-shirt design, it will already be flipped and ready for you to adhere to your iron-on transfer paper. Yes, ma'am...I'm LUCKY and they're CHARMing, that's for sure. By the way, it was their idea to hold hands and lean into each other in their sisterly love sort of way. Melts my heart. Thank you so much for this post. I want to let you know that I posted a link to your blog in CBH Digital Scrapbooking Freebies, under the Page 3 post on Mar. 05, 2012. Thanks again. Your girls are so pretty! TFS this download Monika! Those 2 are so cute! You are lucky to have such willing and photogenic models!! They are adorable! Pic's like these make me long for a daughter. Thank you for these cute printables. Your daughters are adorable. I love the shirts you ironed these on. Where did you get them? Such cute sleeves! I am going to pin this on my Pinterest page. Thanks for sharing! 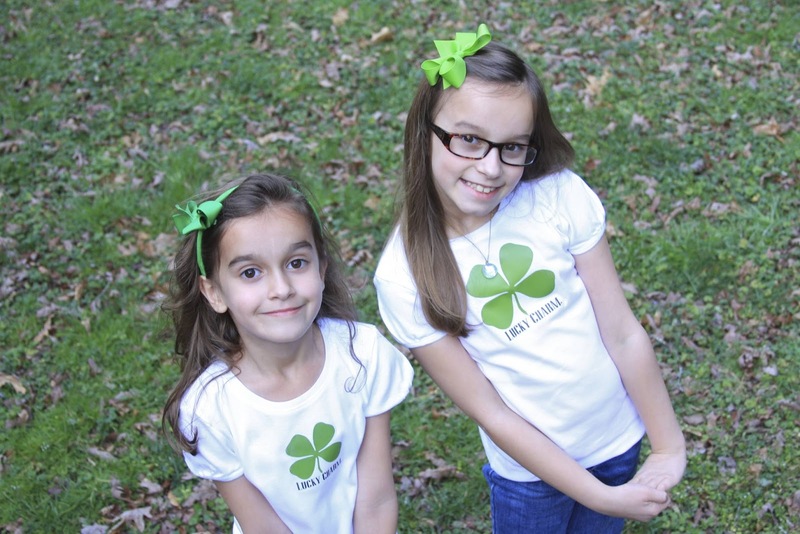 Beautiful girls, love the t-shirts. Cool Paddys day shirts.